We spend millions of pounds on vitamin supplements every year, yet that money is wasted if the nutrients aren't absorbed properly. Before you take a vitamin, look at the guide below for RDAs, dosages, uses and contraindications. Take supplements at room temperature with cool water. Hot drinks can destroy nutrients; iced drinks slow absorption. Don't drink tea or coffee within 15 minutes of taking a supplement as they can interfere with nutrient absorption. Fat-soluble nutrients (including vitamins A, D and E, all essential fatty acids and co-enzyme Q10): if your dosage involves more than one capsule/tablet a day, split the dose and take one dose with breakfast and one with lunch or an evening meal. Probiotics (such as acidophillus and bifidus bacteria): take first thing in the morning and/or last thing at night with, or in, tepid water. Herbs: may be best taken with or without food depending on the type. Consult your herbalist. Amino acids: take 30 minutes before or after food. Minerals: the majority are best taken with food but some, such as zinc, are best taken on an empty stomach and last thing at night. 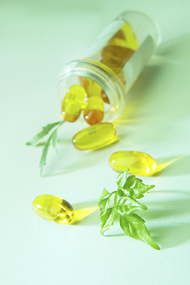 Supplements are available in tablet, capsule, powder and liquid tincture form. If you have difficulty swallowing tablets you can crush them. If using capsules, try to obtain non-gelatine ones. Check the manufacturer's label. Powders and liquids are particularly suitable for children, the elderly and anyone convalescing, as they're easily absorbed by the body. Try to obtain supplements with the least amount of fillers, coatings and artificial colourings and those with natural, as opposed to synthetic, ingredients. Recommended dosages for nutrients should be followed carefully. With supplements it's not the case that more is better; exceeding recommended doses can be dangerous. However, therapeutic doses are usually significantly higher than official recommended daily allowances (RDAs). RDAs have been compiled as guidelines for 'average' people, yet they vary from country to country and don't take account of individual needs. Our lists contain the typical range of therapeutic doses used by nutritional therapists as well as RDAs and maximum recommended dosages for reference. Dosages for children are always much lower than for adults, and men may require slightly larger doses than women. If in doubt, seek advice from a nutritional therapist. Minerals tend to interact with each other and other nutrients and toxins. It's important to take this into account when supplementing your diet. For example, zinc can interfere with iron and copper absorption. Uses in the body: essential for the development of healthy bones, skin and eyesight, particularly night vision; strengthens the immune system, increasing resistance to infection. Signs of deficiency: night blindness (difficulty seeing in poor light), dry skin, poor growth and development. Therapeutic uses: skin conditions such as eczema, acne and psoriasis, night blindness, ulcers, respiratory, menstrual and urinary problems; may also play an important role in cancer prevention. Dietary sources: liver, kidney, oily fish, cod liver oil, dairy produce, eggs and margarine; beta-carotene is found in orange, yellow and dark green vegetables and fruit, such as carrots, yellow bell peppers (capsicum), broccoli, spinach and watercress. Cautions: not to be taken if pregnant or planning a pregnancy. Very high doses (above 9,000mg) can cause toxicity, signs of which include dry, scaly skin, fatigue, bone and joint pains and headache and require immediate medical attention. Discontinuation normally brings relief without further treatment. Best taken: with food at breakfast and at lunch/evening meal for split doses. Uses in the body: essential for carbohydrate metabolism, energy release and healthy heart, brain, nervous system, muscle function. Signs of deficiency: extreme weakness (such as beri-beri in developing countries with poor diet), depression, numbness and tingling in the extremities, poor memory, headache, disturbed sleep. Therapeutic uses: especially useful for those who smoke or drink heavily, do strenuous physical work, have a diet high in sugar and refined carbohydrates, have heart problems or those who are breastfeeding, on a growth spurt or under a lot of stress. Dietary sources: brown, unpolished rice, wholegrains, wholewheat flour, brewer's yeast, yeast extract, nuts, beans, peas, cereals, potatoes, pork. Cautions: not to be taken by people with kidney disease or children under 12 years. Toxicity is rare but has occasionally occurred in people receiving repeated injections of B1. Best taken: in a B-complex, as it works together with other B vitamins, in a yeast-free form with breakfast. Very ill or alcohol-dependent people may be given B1 by injection for maximum absorption. Uses in the body: the several forms of B3 - nicotinic acid (also known as niacin) and nicotinamide - assist with the function of the digestive and nervous systems. They play a role in food metabolism and energy release, as well as the formation of red blood cells and healthy skin. Signs of deficiency: irritability, fatigue, poor memory, headache, dry skin, poor appetite, mouth ulcers, emotional instability, mental changes. Severe deficiency (now rarely seen) leads to a condition known as pellagra, which is characterised by very dry, cracked skin. Therapeutic uses: dizziness, PMS, tinnitus, arthritis and in the treatment of burns, alcohol addiction, high cholesterol, mental problems and hyperthyroid (this requires medical supervision). Useful for athletes, the elderly and people suffering from stress. Dietary sources: meat, fish, dairy produce, fish, fortified cereals, wholemeal bread, brewer's yeast, yeast extract, nuts, seeds, soya beans, potatoes, dried fruit, tomatoes, peas. Cautions: take under supervision if pregnant or breastfeeding. Don't take if suffering from kidney disease or if a child under 12. Intakes of 150mg and above can lead to facial flushing, which is harmless but annoying. Intakes of more than 3,000mg can cause liver problems. Best taken: in a yeast-free form with breakfast. Usually found in supplements in the form of nicotinamide. Uses in the body: needed for normal growth and brain activity, for formation of stress hormones and healthy adrenal gland function, for normal hair pigment and hair growth. Also plays a role in food metabolism. Signs of deficiency: fatigue, weakness, headache, muscle cramps, poor coordination, numbness and tingling, depression, nausea, vomiting, abdominal cramps. Therapeutic uses: to combat stress, as an adrenal support, for those taking the Pill, HRT or who drink and smoke a lot. Also used to relieve headache, insomnia, arthritis, food intolerance, hair problems and bruxism (teeth grinding). Dietary sources: peanuts, liver, kidney, avocado, mushrooms, seeds and other nuts, pumpkin, egg yolks, dairy produce, dates, fish, chicken, wholegrain cereals and bread, dates, bananas. Cautions: none known at recommended usage. Not suitable for children under 12. Best taken: in a yeast-free form with breakfast. Usually found in supplements in the form of calcium pantothenate or magnesium pantothenate, which provides both magnesium and B5. Uses in the body: essential for healthy red blood cells, metabolism, digestion and nervous system. Also helps to maintain fluid balance. Signs of deficiency: irritability and nervousness, flaky skin around eyes, nose and mouth, sore tongue. Therapeutic uses: morning sickness, PMS, insomnia and mild forms of anxiety and depression. Also recommended for women taking the contraceptive pill or HRT long-term, as these can lead to depletion of B6. Dietary sources: wholegrains (breakfast cereals - especially muesli, bran flakes and porridge oats - brown rice and brown bread), wheatgerm, brewer's yeast, nuts and seeds, lentils, potatoes, baked beans, soya beans, bananas, white fish, meat. Considerable losses of B6 can occur during cooking. Cautions: not to be taken by children under 12. If pregnant, it's best to get professional advice on dosage. High doses of B6 (100mg and above) can cause side effects including numbness and tingling in the fingers and toes. Discontinuation brings relief. Best taken: with food at breakfast and at lunch/evening meal for split doses, as a time release-tablet, as part of a B-complex supplement (B2 and magnesium are required for absorption of B6), and in a yeast-free form for those sensitive to yeast or prone to abdominal bloating. Take plenty of water to aid absorption and prevent urine discoloration. Uses in the body: contributes towards healthy nervous and cardiovascular systems, the formation of red blood cells and bone marrow, production of genetic material and metabolism of fats, proteins and carbohydrates. Signs of deficiency: exhaustion, anaemia, pallor, pins and needles in hands and feet, irritability, depression, shortness of breath on exertion. Therapeutic uses: anaemia, fatigue, digestive problems, mental or nervous problems. Vegans and vegetarians can become deficient in B12 as it's mainly found in animal produce. Dietary sources: meat (especially liver), fish, eggs, dairy produce, fortified cereals, brewer's yeast, yeast extract, blackstrap molasses, seaweed (it's present in blue-green algae such as spirulina and chlorella, but it may not be well absorbed by the body). Cautions: the form hydroxycobalamin is preferable to cyanocobalamin, which can aggravate certain eye conditions. Check the labels. Toxicity is very rare. Best taken: by injection for best absorption. Drops (taken with water or under the tongue) may be better absorbed than tablets. Take at breakfast with food.